Allwin Electric is a premium brand known for its BEST quality products like PVC Conduit Pipes, Conduit Accessories, Switchgear & Metal Boxes. (Please note we can manufacture custom quality products also, as per customer's requirement & budget). We are offering Allwin Electric - 20mm PVC Conduit Pipes to our clients. Please note we can manufacture custom quality products also, as per customer's requirement & budget. We are offering Allwin Electric - 25mm MMS PVC Conduit Pipes to our clients. We are offering Allwin Electric - 25mm HMS (SPL) PVC Conduit Pipes to our clients. 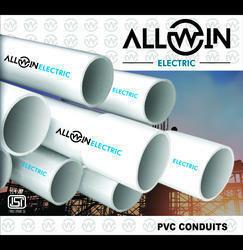 We are offering Allwin Electric - PVC Conduit Pipes to our clients. We are offering Allwin Electric - 25mm HMS PVC Conduit Pipes to our clients. We are offering Allwin Electric - Rigid PVC Conduit Pipes to our clients.